Image credit: North Bridge Press. and other titles by this author. This is a guide to help people change jobs when headhunters are involved. It's not intended to help a job hunter find a baited hook or recruiter. I want to help you profit from working with good headhunters. That means learning how headhunters operate and how to work with them." 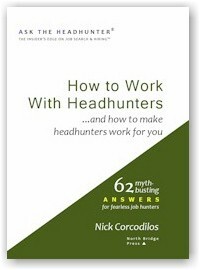 --- Nick Corcodilos, Ask The Headhunter©, author of "How to Work with Headhunters: 62 Myth-busting Answers for Fearless Job Hunters", page 8, published by North Bridge Press in 2009 with a list price of US $39.95. To learn more about "How to Work with Headhunters", and other titles from this author, please click here. My first impression of this e-book was the dedication by its author to keep the reader's needs in mind. He used a generous-sized type face, crisp green sub-headings (green drop caps are also used for "Q and A" sections), along with ample use of white space. These factors are often overlooked with e-books, and I am certain that you will benefit from this reader-centric perspective. There are 130 pages in this publication; however, it is not cluttered which makes this an enjoyable reading experience. A shorter page style also makes printing out helpful passages easier. Navigation within the e-book is easy with the intuitive left-hand side bar. A quick click will take you to your desired destination via neatly organized bookmark links. There is a detailed table of contents, five sections organized into 29 concise chapters, and a "Back of the Napkin" bonus entry that acts as a synopsis of advice. Mr. Corcodilos' writing style is direct, engaging, informative, conversational, and occasionally, blunt. He uses no-nonsense language to make his points crystal clear. The author features a question and answer format to introduce new topics which will reinforce your grasp of the subject matter. This style also makes the book more personal. The author talks to you as if there were an in-person consultation. His advice is contrarian and refreshingly realistic. He will challenge your miconceptions of headhunting, and make you focus on how the relationship works from both sides of the table. One innovative touch that I liked was the use of "!" and "Ie" icons for tips, suggestions and "Insider's Edge" advice. The author also used "How to say it" boxes. All of these learning tools help you to target and digest areas of special interest. Mr. Corcodilos teaches you how to avoid bad headhunters and how to cultivate the true professionals. This advice alone is worth the price of the publication. He also provides a copious amount of common-sense advice. The chapter to explain the differences between headhunters, recruiters, career coaches/counselors, job placement agencies, and job shops was especially enlightening. A rose by any other name may smell as sweet; however, as you will see, "headhunter" is a special flower in the bouquet. Mr. Corcodilos provides advice that will save you time, money and perhaps the damage from making the wrong career decision at a critical juncture. The author teaches you how to create and add value not only during a headhunting relationship, but within the dynamics of your own career. Another benefit of this book is learning the art and skill of qualifying others. Especially in an Internet age where we are inundated with information and proposals, knowing how to verify a company, individual, or opportunity is an integral skill. Such a capability benefits freelance writers, MBA students, and C-suite executives alike. This book will teach you how to become your own headhunter for those of us who many not be prime candidates for the three percent club. That may be the most compelling feature of this intriguing, informative and useful career book. I received a complimentary review copy from the publisher, North Bridge Press. I was not financially compensated for this article by the publisher, author or any party who would benefit from a positive review. Nick Corcodilos started headhunting in California's ultra-competitive Silicon Valley in 1979 and is host of the acclaimed Ask The Headhunter website. With this provocative new Answer Kit, Nick continues the contrarian, candid Q&A he started online in 1995. Nick invites "fearless job hunters" to listen in as he teaches how to earn respect for what you know, and how to learn what makes employers tick—and reveals how to demonstrate that you'll bring profit to a company's bottom line if they hire you. Steve Amoia is a freelance writer and translator from Washington, D.C. Steve focuses on career-related themes, Chinese healing/martial arts and international soccer journalism. He is the publisher of World Football Commentaries. This review was originally published at the American Chronicle in June 2012 and is republished here on 18 June 2012 with the kind consent of Mr. Corcodilos.